A special combination of cooling Organic Aloe Vera and stimulating Seaweed, which assist in reducing puffiness and stimulates new tissue growth. Roman Chamomile and Rose Otto essential oils work in tandum to soothe, nourish and restore soft, supple skin. 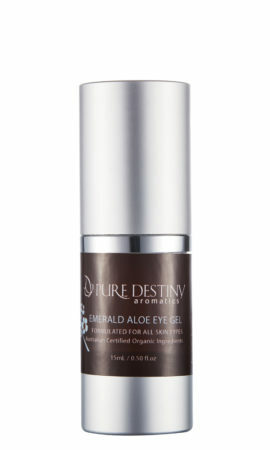 The eye gel is dispensed through a handy dropper and can be used throughout the day to refresh and revive tied eyes. BENEFITS A combination of Cooling Organic Aloe Vera And stimulating Seaweed. Assists in the reducing puffiness and stimulates new tissue growth. Chamomile and Rose Essential Oils work together to sooth and nourish. Helps restore and maintain soft supple skin. SALON USE Gently pat around the entire eye area with ring finger. HOME USE Apply day or night. Gently Pat around entire eye area with ring finger. ACTIVE INGREDIENTS: Organic Aloe Vera, Seaweed, Vitamin E , Rose and Roman Chamomile.